Tomorrow, we will need leaders, developers, and thinkers to govern our society, and a host of workers across the spectrum from specialist to generalist. To do this, we must promote education, and above all, keep kids in school, by encouraging troubled youth to pursue a dream and to never give it up. That is exactly the mission of the Foundation Trioomph established by the CEO of Telesystem, François-Charles Sirois, and by Sylvie Leduc. How to do it? 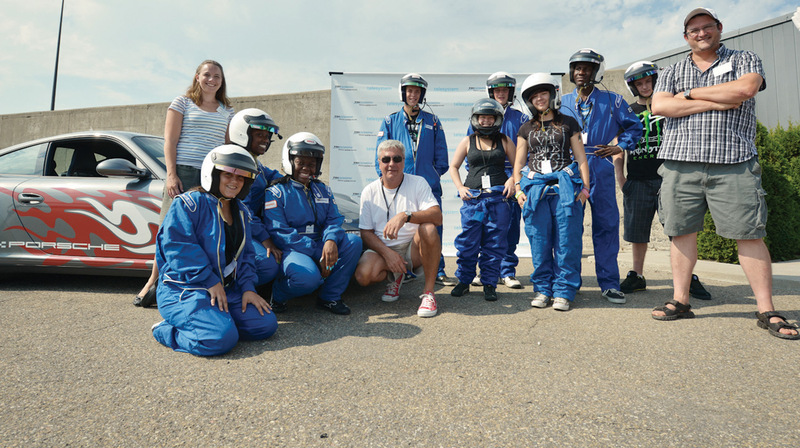 By allowing those who persevere in their studies to experience an exceptional day, filled with action and emotion… on a race track! For five days last July, at the ICAR motorsport complex in Mirabel, nearly 400 Trioomph 2012 award winners circled the track under the guidance of driver-mentors. “I loved my day! I sat in several dream cars and the drivers were really awesome!” commented Kevin Lefebvre of Saint-Jean-sur-Richelieu, one of 3300 participants aged 13-20 from 33 schools identified where success can be challenging for students. Partners critical to the success of the initiative included Telesystem, Michelin Canada, Pneus Belisle et Supérieurs, Ubisoft, Porsche Prestige, ICAR, Vortex, and Maximiz. “My pilot-mentor has been a great inspiration to me by demonstrating that even three hours of focused effort a day can enable success!” concludes Karelle Massy, a student at L’Assomption who will cherish unforgettable memories of this unique experience. Proof that the automotive world has no false starts!